“Impossible, n’est pas français !” ( the Impossible, is not in the French DNA) Would that be correct, speaking about the Monégasque team ? After all, they’re not French, even if they speak the same language as the home country of Molière. Let’s say that maybe they are a little bit, as they play in Ligue 1 and Praise Dame Luck who chose their side. There are now two French teams in the Champions League’s quarter-final, a big improvement, since the last time was in 2010( Lyon and Bordeaux). Monaco joined PSG, but the Parisians’ qualification was heroic and this can’t be said about the Monegasques’ game. The best team(Arsenal) won but didn’t go through; is it because of their lack of humility, against an “easy draw” in the first leg? Monaco’s boss, Leonardo Jardim spoke about the Gunners “disrespect” and it seems that he’s quite right. Not an easy evening, for the Brazilian DF ; he didn’t defend efficiently as he should have done and was involved in both goals. He fought well, but sometimes was slow to react on Arsenal’s attacks. Nevertheless, he won several important duels near the penalty area (17th 22nd 38th). A very good first half (18th 21st 28th) but quite anonymous in the second period; tired maybe ? He started well, but he lost the thread very quickly; his error in Arsenal’s second goal could be dramatic for his teammates; he was an easy prey for Alexis Sanchez. A game to forget! Not an easy game for the Captain; absent in the first leg( redcarted) he was placed too high to help the central defenders. He was more a spectator than a player! An interesting game from the youngster; good presence on the pitch, won many physical duels ( 18th 29th) Monaco are lucky to have him. Yellowcarded(52nd). 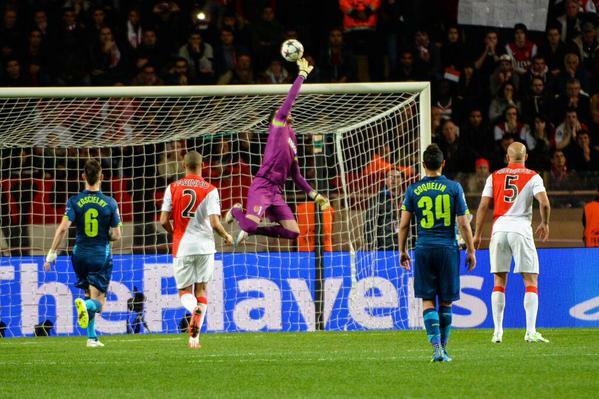 The Portuguese International, showed again his class and his game- experience is more than welcome to Monaco. Very offensive during the first half, joined in defense as they did all his teammates, in the second period.Two good free kicks (9th 62nd). The MF had a bizarre game; defending, as the rest of the team but offensive too, proposing some interesting counter-attacks; he was subbed by Elderson Echiejile (86th). He played well, during the first ten minutes, but Arsenal’s defense muted him and was quite useless to his team, for running around wasn’t sufficient. He was subbed by Yannick Ferreira-Carrasco (59th) which was more dangerous, producing some interesting situations, (72nd). After a good pass to Moutinho (3rd) the Bulgarian was in perdition, staying up front all alone and was unable to help the team, but some rare defending. He was subbed by Bernardo Silva (70th) which was faster, but clumsy during the counters.